EPS Literacy & Intervention is a North American leader in the delivery of educational solutions that assist struggling students. The organization focuses on providing innovative solutions for children in the K-12 range to improve both reading and math skills. 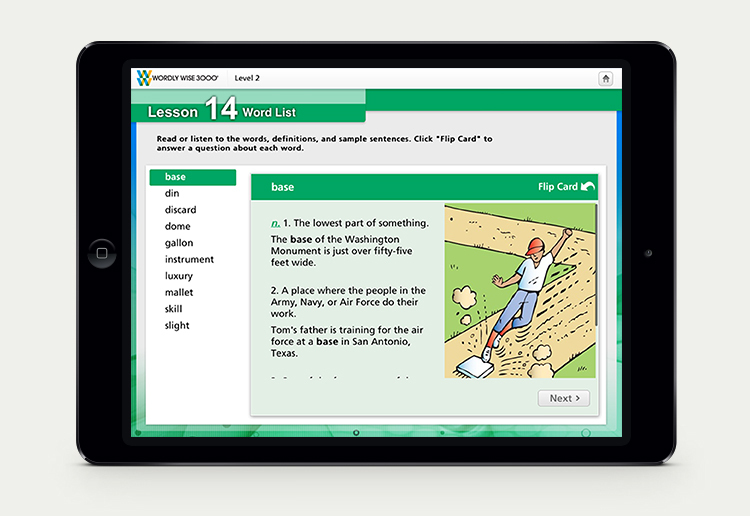 For decades EPS has armed teachers with tools to assist in the development of their students. With today’s ever-changing landscape of innovations in technology, the company identified the need to shift its product line from the traditional Flash-based online platform to a tablet-friendly ecosystem. 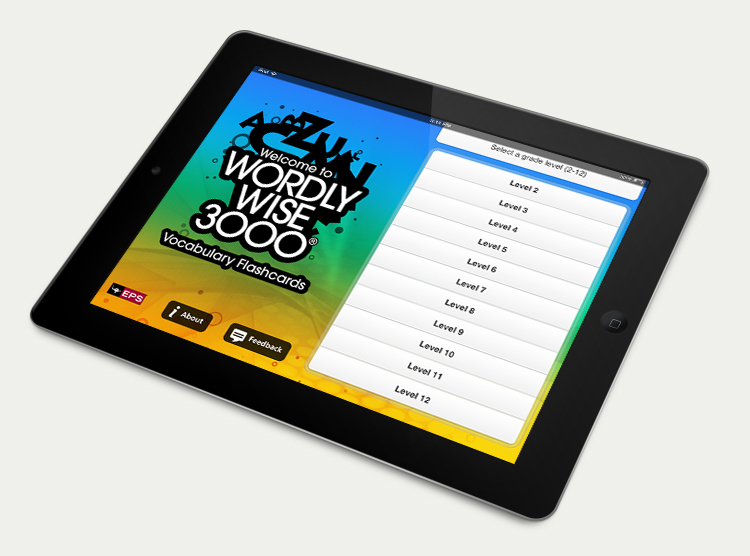 Industrial worked closely with EPS’ Ottawa and Boston teams to plan and implement an iPad version of their existing Wordly Wise 3000 learning software, focusing on the core vocabulary modules for its initial release. Using the existing product as a base, Industrial first created annotated wireframes that defined the core user interface for the iPad app. This work focused on the transition from mouse-based interaction to touch-based interaction, taking advantage of many of the built-in user interactions provided by iOS – Apple’s mobile operating system. The wireframes provided a detailed roadmap for the implementation phases of the project, and ensured that all key stakeholders had a full understanding of planned functionality. Industrial’s graphic design team worked with the existing EPS and Wordly Wise brands to create a user interface design that was compatible with both retina and non-retina iPad displays. 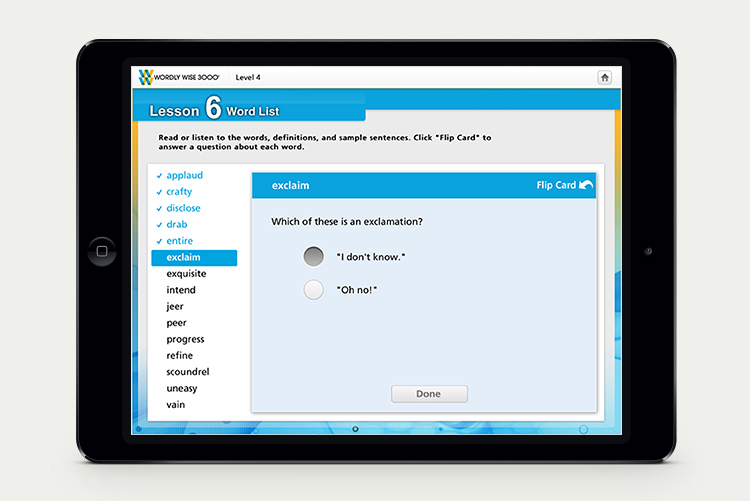 With a targeted audience of children ranging from Kindergarten to Grade 12, the app had to maintain an inviting and clean user interface, with very clear navigational aids. Using an iterative approach to the project lifecycle, Industrial’s technical development team worked closely with our creative group to develop the product as a native iPad app, delivering regular builds to the EPS project team and tracking bugs and change requests in real-time. The app was integrated with EPS’ existing data warehouse via web services for the display of content, and an analytics engine was integrated to allow EPS to track the effectiveness of the app. The end result? A fully-encapsulated native app, deployed to the App Store, within budget on an aggressive timeline. EPS Literacy & Intervention is a North American leader in the delivery of educational solutions that assist struggling students.